As I entered the Museum of Alternate History on Sunday in Sheraton Augusta, I had the good fortune to meet the knowledgeable and charming Elizabeth Carpenter, who has been the caretaker for the past 6 years. The museum, she explained, is the brainchild of award-winning costume designer Paige Gardner, who currently works with the Costuming track. 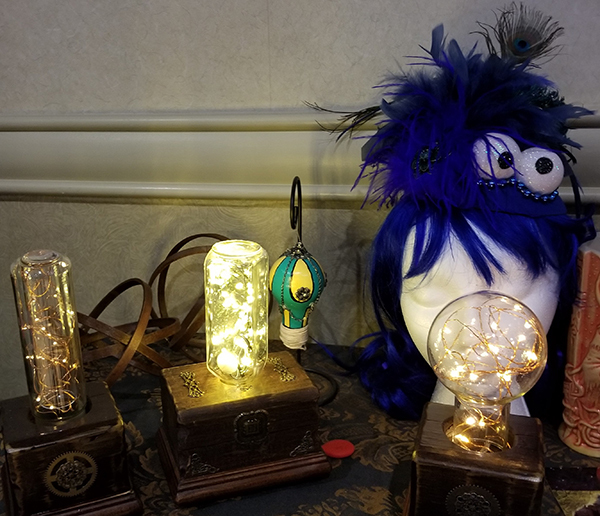 Gardner was acquainted with quite a few makers and wanted a place for Dragon Con attendees to view their amazing creations up close and personal. The museum is officially open for an hour each day, but its treasures remain on display throughout the convention, even when other panels are using the room. Carpenter meets the makers, helps them set up their displays, and elegantly greets visitors at the door. She also works with the Free Art Friday organization, FAFATL, which is a movement of artists here in Atlanta who place free art around the city in a scavenger-hunt, you-find-it-you-keep-it style. Some of the artists from the group had items on display in the museum. 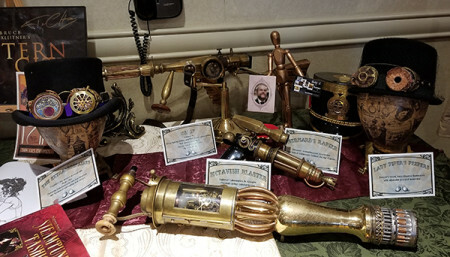 While wandering along the self-guided tour, gazing at flickering Edison bulbs and gloriously detailed contraptions that spark the imagination, I bumped into one of the makers, a cheery gentleman named Robert Sienko, aka Bert from Mary Poppins. Sienko got involved in steampunk about seven years ago, when he attended an Alternate History Track panel. “I was fascinated by the way Victorian and science fiction could go together,” he said. Sienko started making props for cosplay, and his art developed from there. 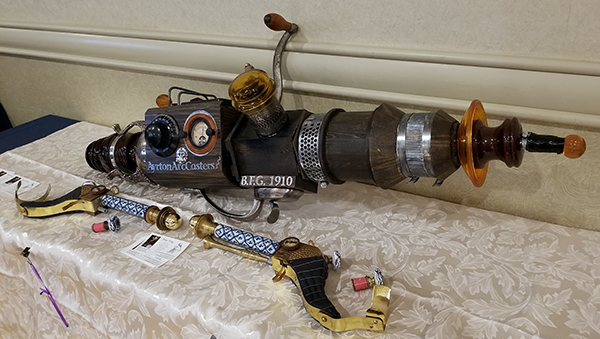 His display included a sound-wave rifle, a device for traveling between dimensions, and a bullet-echo-wave gun. He develops backstories for each of his designs, such as a laptop that he converted to nuclear power when he got stuck while travelling back in time. This is the fourth year he has displayed his work in the museum. As I moved to the next exhibit, I met another maker, David Lee, who became interested in steampunk through his wife’s belly dancing. 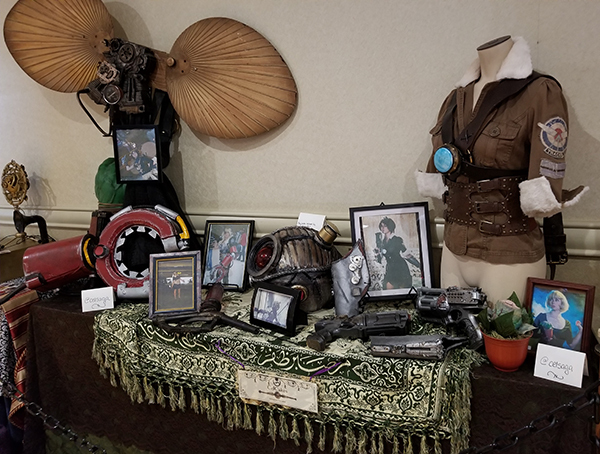 They were hosting another troupe that had asked for steampunk as the theme for the gathering. Lee had never heard of steampunk before, so he looked it up online. From that moment on, he was hooked. “I found my calling, my people,” he said. At the time, Lee was already making costumes for film extras, so he had some of the necessary skills. The rest, like carpentry and metalwork, he learned as he went along. 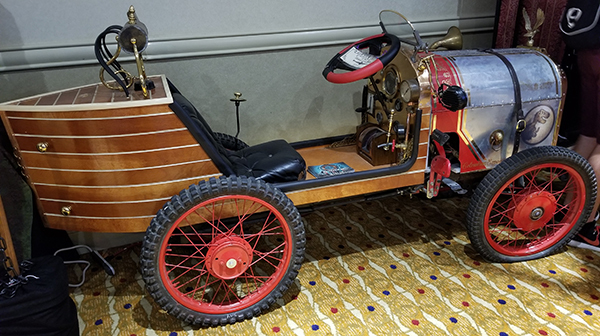 He says that he just lets his inner five-year-old come out and play, and he hopes to spark that same reaction in other people who view his vehicles and contraptions. Lee also writes steampunk and started his own publishing company, HTS Publishing. The artifacts on display were fantastic conglomerations of elaborate Victorian splendor melded with imaginative anachronistic technology. 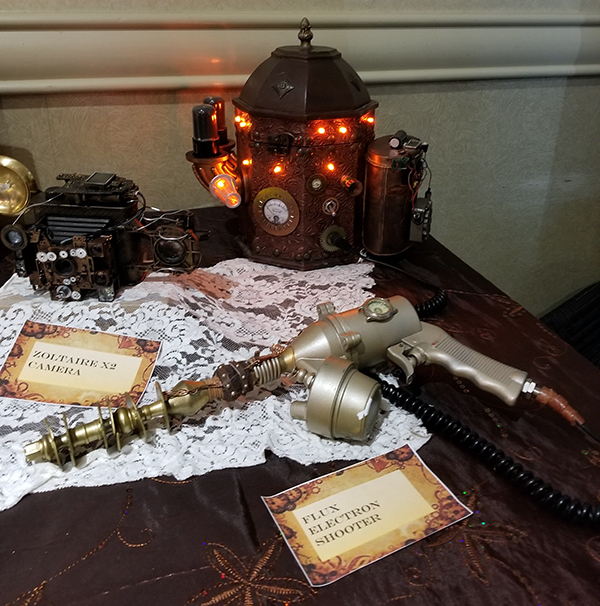 It’s easy to see why steampunk draws so many creative people.